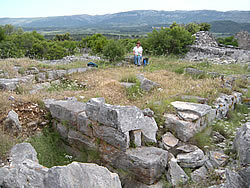 Maslinovik is an old watchtower set on a hill on the north side of the Stari Grad Plain. Built in the 4th century BC by the ancient Greek settlers, it formed part of the line of defence for the fields, running from the town of Pharos (today’s Stari Grad) to Tor, a second watchtower set high on the cliffs above Jelsa. The existence of two massive watchtowers shows that the Greek colonists were not entirely secure on the island. In fact, the natives took great offense at the incomers and after the first year they called in help from fellow Illyrians on the mainland. 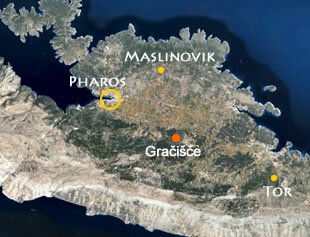 The Greeks from the neighbouring island of Issa (today’s Vis) also pitched in, and the resulting battle left many dead. The dramatic events were recorded in the first century B.C. by historian Diodorus Siculus. Following the battle, there seems to have been an uneasy peace, with the Greeks in Pharos surrounded by big defensive walls, emerging out during the day to farm the fields of the Stari Grad Plain. 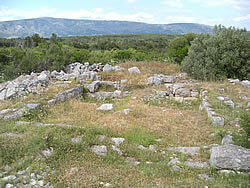 The Illyrians had the rest of the island, including the hillfort of Gračišče directly overlooking the plain. The watchtower of Tor was built on a high cliff at the eastern end of the plain, providing a good view over the surrounding area, including the sea. But since it doesn’t have a clear line of sight to Pharos, a second watchtower was needed on the hill at Maslinovik. If enemy activity was seen by the lookout on Tor, smoke signals would have been sent to Maslinovik, and on to Pharos. Maslinovik signpost – I see a sign! Maslinovik is an easy walk up from the plain, starting from the one pond in the area. 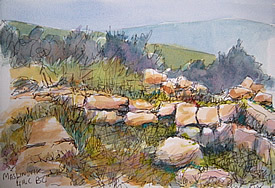 That’s a distinct feature now as then, when the Greeks used it as the starting point to measure out the land parcels. Heading up the hill, take a right turn near the top, when you see a break in the wall. There’s no sign, because everybody knows that’s the way, right? Follow the path round to the right of the hill, and look for a left turn just as you reach the ruined houses. Again, it’s pretty much just a break in the wall with some steps. Keep heading upwards to the top of the hill. Finally, as you round some bushes, a large red signpost labelled Maslinovik appears! Very helpfully written in English (is no one else interested, I wonder?) 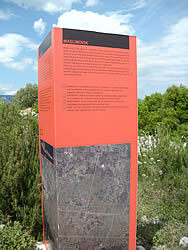 it provides a description and an aerial map of the site. You’re there! Most of this tower has been recycled into nearby houses and walls, but the enormous square blocks of the foundation stones are still in place – the classic sign of a Greek building. Maslinovik is impressive for the sheer size of those blocks. Must have been murder to move, let alone cart them up a hill! Or perhaps they were cut from the ground up there? At any rate, those are good, solid foundations that haven’t moved in 2,400 years. And the views from that hill… beautiful in all directions! We had our picnic up there, sitting on the stone blocks of the tower, with nobody else around. Maybe Maslinovik gets more visitors in summer, but we had it to ourselves in May. Next to the tower is a pit, possibly a shelter related to the watchtower but it wasn’t clear. A ruined house with a caved in roof stands to the south and is probably where a good few of the stones from the watchtower ended up! We headed downhill a different way, circling round the hill to the east past what looked like a ruined hamlet. Interestingly, the garden plots were still neatly cultivated – it doesn’t do to waste good growing soil! Lovely views over the island on the way down as we followed an old pathway, then turned right onto the road. You can’t really get lost, not with the grid pattern of fields and roads!